Do elite gymnastics competitions need to be more fun? There's an old saying - if it ain't broke, don't fix it. However, after the viral success of Katelyn Ohashi's 'Perfect 10' routine earlier this year, does gymnastics - at the top level, at least - need to be more fun? World Snooker chairman Barry Hearn evidently thinks so - and his 'Superstars of Gymnastics' format launched at London's 02 on Saturday. But how did it play out? Flossing, funky chicken and a golden buzzer - gimmick or great fun? Hearn signed up some of the sport's biggest names - including world and Olympic champions Simone Biles and Max Whitlock - for the exhibition event, which was watched by 8,000 fans. "Events like this are what gymnastics has needed for a very long time," said Britian's Whitlock, who played the role of judge for the day, along with American Biles, her coach Laurent Landi and British Olympic bronze medallist Amy Tinkler. And perhaps he had a point. This was a chance for gymnastics to have a bit of a laugh. There were no rules, no restrictions and no lack of personalities. We saw Marcel Nguyen flossing on the parallel bars - the event in which the German won a silver medal at London 2012. During the women's vault, Canada's 2018 Commonwealth all-around champion Ellie Black theatrically scoured Biles' autobiography for tips, before cheekily enlisting Whitlock to move apparatus for her. And nowhere else would German former Olympic high-bar champion Fabian Hambuchen be able to say after a floor routine: "That's probably the first time anyone's seen the funky chicken in gymnastics." There was even a golden buzzer, with each gymnast given the opportunity to double their score on one piece of apparatus. But is this really what gymnastics needs? 'Superstars' was far removed from elite gymnastics - and some would say too far. It was staged at the same time as the Birmingham leg of the World Cup, which was shown live on the BBC and featured British champion Ellie Downie, seven-time Olympic medallist Aliya Mustafina of Russia and American newcomer Riley McCusker. Craig Heap, a Commonwealth gold medallist who competed for Great Britain at the 2000 Olympics in Sydney, believes competitions such as Hearn's are good for the sport - as long as they are not to the detriment of the traditional events. "The biggest shame is gymnastics fans had to choose between attending an exhibition event or seeing world-class athletes compete in Birmingham," he said. Many would agree that pitting two big events against either is not good for a sport - it would be like British heavyweight boxers Anthony Joshua and Tyson Fury fighting at the same time in different places. But the counter argument is that two major UK arenas were full of gymnastics fans on the same day, so the sport can sustain it. "Gymnastics is not necessarily struggling for participants - there is a waiting list of 1.2 million to get into clubs in the UK - but maybe something needs to change", said Heap. What could elite gymnastics take from this? The music: Watching routines set to well-known commercial music is undeniably fun - a floor routine with a soundtrack of Drake, Migos or even AC/DC added to the relaxed atmosphere. Elite gymnastics is often performed to classical music. The personalities: Many of the best gymnasts in the world are aged between 15 and 25. Allowing them to embrace their youth, their character, and the confidence they have gained from gymnastics can only be a positive. The safety: When a gymnast feels they are not in any danger of injury, they allow themselves to enjoy their performance more. Adding a crash mat underneath a release move on the uneven bars would take nothing away from the performance. And the fans in the audience feel more relaxed, knowing their favourite gymnast is in less danger of hurting themselves. 'The crowd were scared to get involved' - should the UK be learning from the US? This more "entertaining" breed of gymnastics is common in the United States college system (the NCAA). It's a team sport there, with each individual's score contributing towards an overall mark for their university. Those not performing cheer and shout during performances to encourage their colleagues which, in turn, riles up the crowd. The focus is less on the individual athlete and more on how each competitor is helping out their peers, creating genuine camaraderie. British former Olympian Ruby Harrold competes in the NCAA for the Louisiana State University Tigers (LSU). Every fortnight the Tigers compete in front of a 12,000-strong home crowd in the Pete Maravich Assembly Center (P-MAC). 'The Deaf Dome' - as it is known - is famed for its raucous atmosphere. "The roar you get when the announcer calls your name is deafening," says Harrold. "Your team-mates hyping you up and the fans screaming is one of my favourite moments. It can get so loud you can't even hear the person next to you talking. "When one of us sticks a landing, the entire P-MAC erupts. I'm almost certain it makes the entire building shake. "They feed off us and vice-versa. The louder they scream, it gets us more fired up." Harrold, who ended her Team GB career at the age of 20 after competing at the 2016 Olympics, says she has a renewed sense of enjoyment in gymnastics, which she puts down to the lower degree of difficulty leading to less personal pressure. "It is a lot easier to enjoy yourself when the skills you are performing require less mental preparation and are less physically demanding," she says. "Gymnastics is first and foremost entertainment. People just want to come to see you do all sorts of flips and tricks and to have a good time. College gymnastics definitely gives you that." Jamaica's Danusia Francis, who competed alongside Ohashi for the UCLA Bruins, was a big hit at the 02 on Saturday and agrees international gymnastics audiences can learn something from college sport. "At the beginning the crowd were scared to get involved because they aren't used to being allowed to make loads of noise. At a college meet, there's no holding back - even just the 12 team-mates are louder than this crowd were to begin with," she says. "They got into it eventually but it would be great to see more people getting involved from the start." And should gymnastics go back to the 'perfect 10' system? The last time the "perfect 10" system was in place was 2006. Another panel looks at the execution - the base score is 10 with points taken away for errors or falls. Some argue this system strongly favours extreme difficulty over form, execution and consistency because it effectively eliminates those with lower start values from medal contention before anyone has even performed. 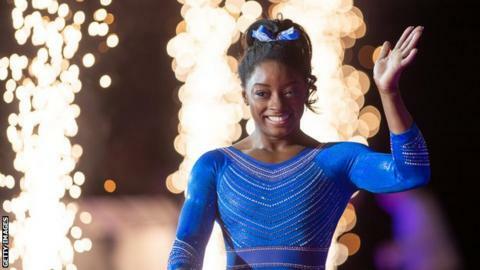 Whitlock says it is "very important" the sport evolves, adding: "Gymnastics is very confusing and no-one really knows what a '15.355' means. That takes away from the atmosphere and means the audience doesn't really get involved in the competition." So should gymnastics return to marking performances out of 10? Briton Nile Wilson tells BBC Sport: "Gymnasts have progressed the difficulty of their routines so much in the past 10 years that simply marking it out of 10 wouldn't be able to accommodate that." But Francis says: "When you look back at some of the routines people did when they scored out of 10, there was loads of unique choreography and people always tried new ways to make themselves stand out - that's what you had to do when you were on a level playing field. "I would never want to water down the best gymnasts in the world like Simone Biles or Aliya Mustafina, but capping the level of difficulty would still allow the top gymnasts to have their really high start values - but make it easier to understand for audiences." So what did the fans think? Some voiced frustration the World Cup and Superstars ran at the same time, but most spoke positively of the atmosphere of the London event. One said Superstars was his daughter's first gymnastics event, and when asked if he would take her to a slightly more 'strict' competition, he didn't hesitate. "Of course I would. She loves gymnastics and just wants to watch the best gymnasts in the world to inspire her. I've also dragged my teenage son here. He's seen a floss and a dab - all he needs now is to see a moonwalk and he's happy." Others said the competition was "a lot less stuffy" and that incorporating a "fun section in elite gymnastics where they can express their personalities more would be amazing". Events like Superstars are a great way to introduce younger fans to gymnastics and what was evident, above all, is that after more than three hours of watching some of their new idols, there were kids in sequined scrunchies and light-up trainers cartwheeling out of the O2. If gymnastics is about anything, surely it's that?